We Handcraft Boutique Wind Chimes, they are 100% made in New Zealand. Our wind chimes are delightful musical sculptures designed to deliver spontaneous and soothing music, whenever the wind blows. Precise cutting of pipes ensures concert pitch tuning of notes in Pentatonic scales. These sweet melodies help to bring a sense of peace and a reminder to our connection with nature. We take great care, attention and love in the process of each windchime, not only with the sound but also the aesthetic beauty. And, it is our wish that this love and beauty is imbued into your life and the lives of your loved ones as you hear and see your windchime sing. Magnolia wind chimes come in a range of stunning colours and are crafted from the highest quality materials. The windchime pipes are hard wearing and fade and corrosion resistant, even in a coastal climate. The windchime strings are UV resistant polyester braid which completes this musical instrument to be safely hung outdoors. They are a durable and delightful addition to any home, garden or landscape. And they make a great gift item, fantastic for almost any occasion. Joyful Breeze (Smallest Size) - available in ten stunning colours. Mountain Stream (Standard Size) - available in four colours. Cathedral (Largest Size) – available in four colours. All colours are powder coated (an enamel-like finish baked on at 200°C ). This makes the aluminium pipes very hard wearing and fade resistant, they are naturally corrosion resistant, even in salty conditions. 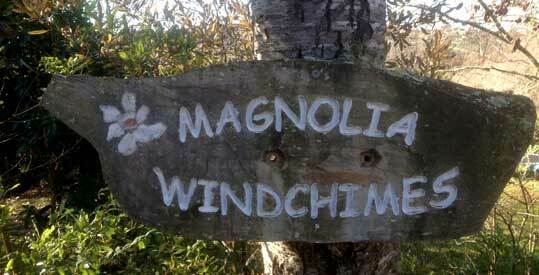 Magnolia Windchimes have been making windchimes for nearly twenty years in the valley. Our aim is to make windchimes that create music composed of soothing and enjoyable sounds, and are aesthetically pleasing to the eye. We put a lot of attention and love into each one of our windchimes. Within the Chinese art of Feng Shui, (meaning Wind & Water) windchimes are an important aspect in helping to create balance and harmony in people's environments. A windchime can help people to remember their innate interconnectedness with nature. Our windchimes are not something that make a "noise". Rather they are designed to help bring love, peace and harmony to peoples lives through soothing melodies. Magnolia windchimes come in a range of brilliant colours and are crafted from the highest quality materials. They are a durable and delightful addition to any home or garden. Front & Back Door Areas; You don’t need a breeze to make the windchimes sing, they are lovely to place in an area of little or no wind and just gently touch them on the way by and listen to the beautiful sounds. Inside; our windchimes are not only for the external world, they are lovely to place inside and gently touch them on the way by and listen to the beautiful and peaceful sounds. Windchimes for Meditation Spaces; much like a meditation singing bowl, our windchimes are lovely to hang and use in a meditation practice. Commemorative Gift; lovely gift to remember any occasion; loss of a loved one, weddings, mother's & father's day, your special valentine, birth of a child. Makes a fantastic Christmas gift too. All our windchimes come in a lovely presentation box with free gift wrapping and a card if you wish (just fill in the "Message if sending the windchime as a gift:" box and we'll include an appropriate card). We can deliver windchimes within 2-3 days of ordering within NZ, and 5–10 days to most other destinations. (see delivery charges in the "Buy Now" menu section) . "My windchime brings a smile to my face eveytime I hear its beautiful music."